Details relating to the Slovenian Commemorative of 2017. 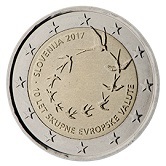 The coin celebrates the 10th anniversary of the adoption of the Euro as the official currency of Slovenia. The motif shows 10 swallows flying in a circle obviously representing the ten joyous years of having the Euro! Around the lower half of the inner circle, from nine to three o’clock, is the inscription:” 10 LET SKUPNE EVROPSKE VALUTE”( 10 YEARS OF COMMON EUROPEAN CURRENCY). From nine to twelve is the issuing country and year of issue – SLOVENIJA 2017. The coin does not have a mint mark. Return from Slovenian Commemorative 2017 to euro coin collector.